We have acquired latest and robust machinery to bring forth an innovative product line. Our manufacturing base is equipped with highly advanced processing facility with adequate expanding capacity. In addition to this, we have incorporated hyper connected distribution networks and effective quality regulation units sprawling over spacious vicinity. We also have recreational facilities, which let us adopt expedient practices to achieve high productivity in our business activities. Our R and D lab is equipped with latest Analytical Instruments i.e. Rheometer, Abrasion Tester, Tensile Testing, Chemical & Physical Balancer, Oven and other allied accessories are closely monitored by highly skilled chemist & Rubber technologist. Indian Roller Industries is producing super products with Zero Defect Concept. Seamless Pipes, Rounds, and Plates are procured from the market as required in the drawing provided by the customers. After procuring the raw materials, they are machined for proper sizes in a house, plates fitted with the rounds are shrink fitted into the machines pipes for assembly. After the complete assembly of pipes, rounds and plates they are balanced statically I dynamically as required by the customers and finally threading is done on the pipes for grip before rubberizing or PU coating. The blending of Compound: As per application of roller, rubber is mixed with ingredients and chemicals. Mixing: All the ingredients are mixed on kindle mixing & calendaring machine about 3 to 4 hours. Extruding: Mixed compound are shifted to extruder from where 1 to 2 m strips are made and put straight to the automatic wrapping machine with hydraulic press pressure so that there is no air bubbles or foreign particles are there. 5 mm over thickness is maintained to get the actual size while grinding and polishing. 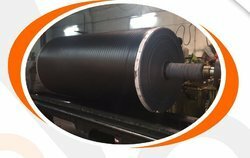 Grinding Process: After Vulcanization, rollers are taken out from the oven and kept for natural cooling and curing for 12 to 16 hours then shifted to the grinding section for finishing. Inspection & Dispatch: Grinded roll inspected on the grinding machine and reports are made accordingly. If found satisfa packed in wax paper, I cotton belt and shifted to dispatch section. To maintain the quality, all the process is controlled by our qualified technician strictly. Before pouring of PU into the mold (which will be 10 mm over than the required size) component, threaded shell and all the ingredient of PU are kept in temperature chamber at 100-degree centigrade for 3 to 6 hours (to avoid any kind of dust or foreign particles). After threading the roller barrel is covered with wax paper which is removed before. Again after 3 to 4 hours, PU material is poured in Baule Machine (latest fully automatic where material color and chemicals are properly mixed with their required ratio. During the above process, mold with its other fitting are fixed around the roller and make ready of PU pouring process. After mixing of materials, roll covered with the mold is kept on the stand and start horizontal pouring from the center. After pouring, roll with hold is shifted for preheating to the chamber at 100 degree C for 3 to 4 hours. After the pre-heating, roller is taken out from the oven for normal cooling and Start Dismantling of roller from the mold. After removing from the mold, roll is kept for post heatingpost-heating 110 degree C for 14 to 18 hour. After cooling, roll is shifted for grinding and polishing section. 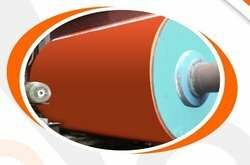 During the grinding and polishing, roll is inspected with our process control. Q.C. Inspector and after the satisfactory inspection, roll is shifted for packing where it is packed with wax paper, Bubble Poly Film and cotton. After packing, roll is shifted to wooden boxes where it get properly packed and ready for dispatch. Here, we would like to inform you that all the process is controlled in house with our qualified and experienced staff.